At tandem with the increase in world population, a dwindling in the number of those seeking a college education in the technical and health sciences and the rising cost of education are forcing many education providers to re-assess their delivery methods in order to generate an educated populace. In attempting to balance the eternally challenging triangle of access, cost and quality of education and learning programs, the emergence and rapid expansion of e-learning had shown enormous potential as an effective supplement to currently existing education and training methods. The concept of "e-learning" is currently fashionable, so, just like "nanotechnology," it's applications have been both romanticized and fantasized into the realm of the irrational. 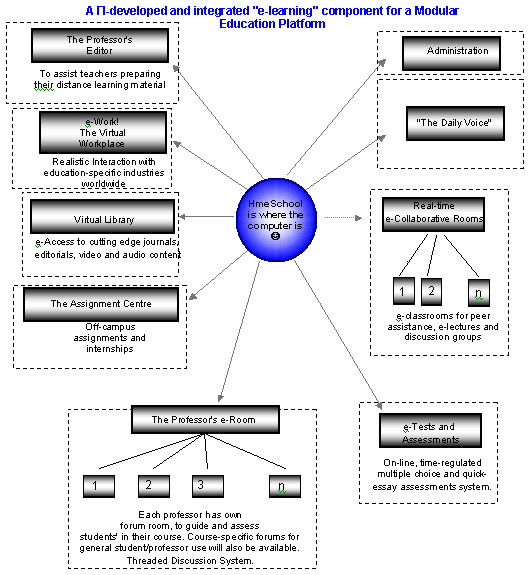 The introduction of e-learning to an education or training component need not a replacement of write-off of existing face-to-face teaching methods (practical study such as laboratory work will always be best practised in a real setting); however, it does provide a new paradigm of resources and interactivity. E-learning and traditional delivery methods each have their own strengths and restrictions and it is the correct balance of these resources for a given course that will provide the appropriate e-learning solution. Π is a leader in the development of cutting-edge modular educational platforms based on a hybridised harmonization of the old with the new forms of education: face-to-face teaching with e-learning. With over 25years of combined experience in areas such as SMET-focused undergraduate and graduate course and program development, IT systems, computer programming and data systems, proprietary video and data compression algorithms and real-time video streaming know how, we have developed both technical and administrative strategies to overcome the inherent problems encountered with a hybridized modular education platform. Current education providers can use their existing resources as the basis of their e-learning strategy, and in situations where an emphasis on self-learning already exists, the incorporation of e-learning may well be attractive. We can also help you to fully develop your educational concepts, and assist in writing grants to governmental and private granting agencies that will help you secure funding to fulfil your education dissemination aims. If one combines access to the diverse external sources of information of the electronic superhighway to the benefits of traditional educational practices, a much richer and potentially productive environment is established. Please contact us to discuss your educational goals and we will assist in finding modular education solutions that suit your scope of operations.